I've recently become fascinated with Colonial American tea history. You may have noticed my last two posts were about early NYC tea history, as well as the introduction of tea to the American colonies. During my research for these posts I came across a tea company that specializes in early American teas. I was so excited to learn I could actually taste the style of teas the colonists were drinking, although they may have prepared them a bit differently (they used the same water temperature for each tea, and sometimes boiled the leaves with the water). Oliver Pluff & Company sells early American blends and unique items such as wassail and cacao shell tea. I had so many questions for the company's founder Kyle Brown, that I decided to turn it into an interview. What inspired you to start a company that sells American heritage tea and herbals? I worked in war zones and disaster areas for 6 years after college as a relief worker in Africa, Latin America, and Istanbul, where I visited numerous tea and coffee plantations and drank a lot of tea. The British Empire has long shadows. Tea is served in all their former colonies and it was surprising to me how much higher in quality the tea was than we had in the South. After I returned home, I launched a premium iced tea business. We met Colonial Williamsburg Foundation at a trade show and they asked us to help create their colonial tea blends. I studied colonial tea products for several weeks, sourced the tea blends from the same gardens that supplied the British East India Company, and we have been building our business in this niche for the last 6 years. We supply our historical tea line to around 300 American historic sites. Now the gourmet world is taking notice of us, and we’re selling to specialty stores in urban centers. Why did you focus only on these types of teas? Oliver Pluff & Co. offers 30 loose teas, but there are at least 10,000 varieties of tea, and many more if you consider tea blends and flavoring. With such a broad mix of products, it was helpful for us to limit ourselves, which focuses our marketing and keeps our tea fresh. How did you learn so much about early American teas? Tea marries well with history. Many do not know about the Charleston Tea Party, Edenton Tea Party, and other dangerous displays of solidarity among the colonies. I have discovered detailed correspondence from the East India Companies that describes their tea trade to the Americas and the growing sentiment of revolt. It’s a riveting subject. This year we are going to dig into some of the physical archives around Charleston to see what we can find that has never been documented for Google. Have you come across anything surprising about American tea history? More than 90% of colonial tea was smuggled across the border to avoid taxation. This tea was considered “loose” tea. What is your favorite tea that you carry? Irish Breakfast hits the right notes for me. It has an intense flavor, high level of caffeine, and a maltiness that I can’t find other tea blends. I created our Irish Breakfast blend from black teas with CTC processing (crush, tear, curl) that brings the tea into small, aromatic, pelletized bits. Assam black tea is the chief ingredient, with a complement of Kenyan tea for some balance. I drink it with a dollop of scalded milk and 2 sugar cubes. The graphics on your packaging are quite symbolic of American heritage. How did you select the designs for your packaging? Our vision is to connect people to American heritage through historic beverages. To that end, we package our products with art and fonts that help our customers step back in time. These historic images are an important part of the experience and the finished products. Do you have any of your own personal tea rituals, and do you share them with your family? I have a hand-made ceramic mug that I like to drink from. I boil filtered water in a kettle. Then I warm the mug to be hot to the touch with a boiling water rinse. Loose tea is added to a Eurotec laser mesh filter, then dropped into the mug where I pour water over the tea. I tend to use smaller tea portions and longer steeping times, maybe up to 10 minutes for some black teas, which yields a slightly bitter tannic flavor that I enjoy. My wife likes to sip ginger tea in the evenings. What are the challenges of selling these teas? We are growing quickly. 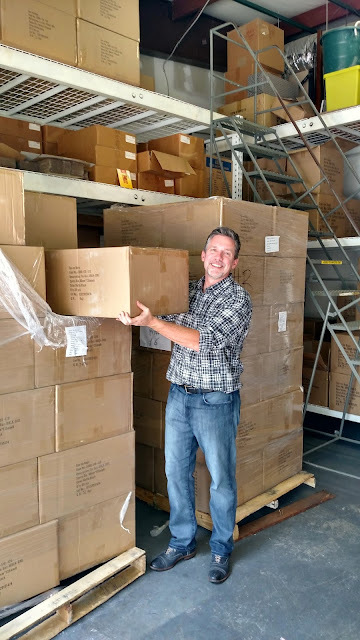 Some months we ship up to 10,000 tea tins and it has been difficult to keep our warehouse stocked. I have to ask- who is Oliver Pluff? We invented and trademarked the name of a fictional character who was born in England, then emigrated to the Americas as a tea trader, Oliver Pluff. For those who are not familiar with the Charleston area, “pluff” is a soft coastal mud that reveals itself at low tide. What are some of your future goals for the company? We don’t limit ourselves to tea. The American colonies were enveloped in a tea craze, but they were also experimenting wildly with all the newly discovered botanicals of the day. Tea, coffee, and cacao were exotic and expensive imports that were all served in the taverns of the colonial era. Our product line of historic beverages now includes tea, coffee, cacao shell, and wassail spice blends. We still have work to do to bring a few more tea products to market that were sold by the British East India Company, teas with obscure names such as Singlo, Congou, and Twankay. We offer a cacao shell tea, but not a colonial drinking chocolate. I have a goal to complete the entire line of products that the colonists were drinking and make them available for sale, as well as the ceramics and silver that were used for brewing. Thank you for taking the time for this interview, Kyle! I look forward to learning more about the obscure blends and brewing vessels at Oliver Pluff when they come available. Also stay tuned for a review of some of Kyle's early American teas. If anyone has a question for Kyle, feel free to leave it in the comments and I'll make sure he gets it! I will post the answers. This is a great interview! My family and I are visiting Charleston this weekend and just discovered the teas of Oliver Pluff & Co. I look forward to brewing them when I get back home. Thanks Lynn! Enjoy the teas! What did you get? Great! Can't wait to read about them. Enjoy!